In today’s Mixed Martial Arts world, we’re enjoying – and, sometimes, complaining about — things which we could have never imagined fifteen years ago. One complaint is there are just way too many fights out there, in too many weight divisions, on the US MMA scene. It’s a funny thing because back in the year 2000, long before Fox or Spike TV got involved — or an internet service like Fight Pass was even possible — MMA was struggling to even survive in the Americas. Big fans of the sport found ourselves scouring Japanese language video stores to rent imported VHS tapes. That’s where we ended up seeing much of the best MMA action, weeks and months after the fact – especially in the lighter weight divisions. Oddly, some of us — even here in the US — miss those days, and not just in a “my favorite band made it big” kind of way. There was a different character to the time. Part of it was the martial arts tradition of Japan – the hushed crowds with respect for athletes, rather than the infamous “Just Bleed” approach. But information travelled slowly and it was tough to keep up with the sport; certainly a far cry from today – where fans shocked to see a fighter who lacks a Wikipedia entry scheduled on their now-weekly UFC events. 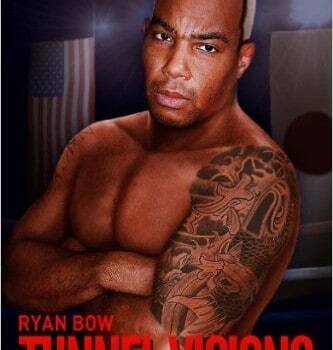 Ryan Bow, author of Tunnel Vision, is a veteran of 26 pro MMA bouts, mostly in that Japanese scene of the early 2000’s. Like many other good fighters of the day (Stephen Palling comes to mind), Bow still doesn’t have a Wikipedia entry. What he does have is a story that really hasn’t been told; and one that’s well worth a look for fight fans. If you loved the fight game and had an attraction to Japanese culture besides, an American fighter like Bow, who rose to prominence in that world, was living a dream – or, so we thought. Bow, of West Virginia, spent years fighting as a freelancer while living in Japan, representing everything from Purebred Tokyo/Killer Bee (a gym he once ran alongside Norifumi “Kid” Yamamoto) to Frank Shamrock USA. He eventually attained fluency in Japanese and became a staple of Shooto shows of the early 2000’s. His life seemed that of a modern day “ronin,” a wandering samurai going from town to town to challenge the best — an African American martial arts star in the sport’s Asian homeland. Dotted on his record are legendary names like Vitor “Shaolin” Ribeiro and Takanori Gomi. Tunnel Vision shows all the struggles behind that illusion – from low pay and family conflicts, to a lifelong illness (a brain cyst, to be exact) that ultimately prevented him from fighting Jen Pulver for the UFC title. What many people don’t realize about the Japanese fight scene, even in the big events, the majority of Japanese fighters are not paid near as much as their foreign opponents. Also, foreign fighters who live abroad were usually paid in cash; even with large sums, immediately after the event. Meanwhile, Japanese fighters, and other fighters like myself residing in Japan, were paid via electric funds transfer up to 30 days after the event. From that perspective, doing things the “Japanese way” actually worked against me. The event promoters knew I spoke Japanese and had earned my spot just as Japanese fighters did, by fighting my way up the rankings. Thus, they were able to justify the difference in pay because we were not well known abroad. They expected us to be good company men and not ask for equal pay. That conflict helps his story stay compelling. It also helps that, simply put, Bow’s story is a life that won’t be lived again. It’s hard to imagine any American ever again journeying to Japan to try and eke out a living in MMA as Bow did. The book, which is sadly brief at 160 pages, alternates between telling that story gracefully to getting a bit awkward — with a few spelling and syntax errors down the stretch. But that doesn’t keep it from being touching and inspiring. If you remember these wild days of early 2000’s MMA well, you’ll enjoy fleshing out some memories of the day. If you don’t, it may be a fun way to acquaint yourself with our sport’s history. It’s easy to imagine a movie of this material. As it is, it’s a quick read that leaves you wanting more – and hopefully, we’ll get it. Last year, Bow moved to Dubai to instruct at a Team Nogueira gym, which sounds like another unique story in the making. Tunnel Vision is available at Amazon.com.